Santa Margarita Catholic High School is a coeducational college preparatory Roman Catholic high school located in Rancho Santa Margarita, California, United States. SMCHS is owned and operated by the Diocese of Orange, and was opened in 1987 under the direction of the Bishop of Orange. Although it follows the Catholic tradition, admission is open to students of all faiths. As of fall 2018, 1,673 students were enrolled in grades 9 through 12. Rancho Santa Margarita is a city in Orange County, California, United States. One of Orange County's youngest cities, Rancho Santa Margarita is a master-planned community. The population was 47,853 at the 2010 census, up from 47,214 at the 2000 census. Although it is named for Rancho Santa Margarita y Las Flores, which was in San Diego County, the city limits fall within the borders of Rancho Mission Viejo. At 20 characters long, it is the longest city name in California. Paul Roger Hackett is a former American football coach. He served as head football coach of University of Pittsburgh from 1989 to 1992 and at the University of Southern California (USC) from 1998 to 2000. Hackett was quarterbacks coach or offensive coordinator for the San Francisco 49ers, Dallas Cowboys, Kansas City Chiefs, New York Jets, Tampa Bay Buccaneers, and Oakland Raiders. The 1998 Purdue Boilermakers football team represented Purdue University during the 1998 NCAA Division I-A football season. They played their home games at Ross–Ade Stadium in West Lafayette, Indiana and were members of the Big Ten Conference. Palmer finished his last season with a total of 309 completions, 489 attempts(63.2%), 3,942 passing yards, 33 touchdown passes, and 10 interceptions while also breaking the school record for most completions, passing yards, and passing touchdowns in a season. He was voted the winner of the 2002 Heisman Award, defeating Iowa's Brad Banks and Penn State's Larry Johnson. Palmer was the fifth player and first quarterback from USC to win the award. After 5 years at USC, he finished his career with 72 passing touchdowns, 49 interceptions, 927 completions, 1,569 attempts, and 11,818 passing yards. He also ended up being the Pac-10's career leader for completions, attempts, and passing yards. Throughout his time in college, he had future NFL players Matt Cassel and Troy Polamalu, as his roommates. Palmer made his NFL debut in Week 1 against the New York Jets. Palmer completed 18 of 27 passes for 248 yards and two touchdowns, but threw a costly interception late as the Jets held on to beat the Bengals, 31–24. "We came here expecting to win," Palmer said. "We had what we needed. We had what we wanted. We had the ball with two minutes to go in good field position and I turned it over. I can’t make plays like that for us to win." Over the next three weeks, Palmer struggled. In Week 2, he completed 21 of 38 passes for just 147 yards, no touchdowns, and 1 interception, but nonetheless recorded his first win as a starter over the Miami Dolphins. In Week 3, he completed 25 of 52 passes for 316 passing yards, but was picked off 3 times and lost a fumble in the 23–9 loss to the Baltimore Ravens. "You can’t get greedy," Palmer said. "When you’re a young quarterback, you get greedy, and I have to fight that temptation. You need to develop patience. When something isn’t there, you don’t just throw it up in the air." In Week 4, Palmer was 20/37 for 164 yards with a touchdown but 2 costly interceptions as the Bengals lost 28–17 to a powerful Pittsburgh Steelers team. Palmer went into the Bengals' week 5 bye with statistics of 84–154 for 875 yards with only three passing touchdowns against 11 sacks, eight total turnovers (seven interceptions and a lost fumble), and three straight games with passer rating of less than 60. The Bengals, meanwhile, were 1–3 and in last place in the AFC North. In Week 4, Palmer again had a rating over 100 in a game against the Houston Texans. Against the Jacksonville Jaguars in Week 5, Carson completed 22 out of 33 passes for 239 yards and 2 touchdowns. However, the Bengals lost their first game of the year, 23–20. The Bengals bounced back against the Tennessee Titans in Week 6. Palmer threw for 272 passing yards and 2 more passing touchdowns. His rating was over 100 for the ninth straight game dating back to last season. "He feels like he’s invincible, but right now he knows he can go win it the next play," Cincinnati coach Marvin Lewis said of his quarterback. "He doesn’t have to win it on every play. And I think that says a lot for how he is and how important he is to this football team." Palmer's consecutive games streak of over a 100 quarterback rating ended in Week 7 against the Pittsburgh Steelers. Carson completed 21 of 36 passes for 227 yards but was picked off 2 times and for the first time all season, failed to throw at least a touchdown in a game. "It wasn’t anything in particular they did," said Palmer, who had a measly 53.8 passer rating for the game. "I just didn’t play well enough to win. I gave them two turnovers. When you play a championship team, you can’t do that." During his rehabilitation, Palmer made several other pointed comments, particularly in an issue of Sports Illustrated . In the article, Palmer stated that: "I hate the Steelers more than I hate UCLA." The Bengals' misfortunes continued throughout the season and a week 15 loss to the San Francisco 49ers ensured that the team finished the season with a losing record for the first time since he had been their starting quarterback. In the same game, Palmer threw his 100th career touchdown pass, becoming the 5th fastest player ever to reach this milestone (59 games). Palmer finished the season with 376 completions for 4,131 yards and 26 touchdowns, with 20 interceptions. His 20 interceptions were a career high, but his 373 completions and 4,131 passing yards set new Bengals franchise records. In the season opener against the Denver Broncos, Palmer threw the ball 33 times for 247 yards, 2 interceptions, and no touchdowns in a 12–7 loss. The critics sought another mediocre season for the Bengals, with a lack of offensive production. The offense bounced back in week 2 against the Green Bay Packers. Palmer threw for 185 yards, 3 touchdowns, and 2 interceptions in a 31–24 win. In week 7 against the Chicago Bears, Palmer was 20 of 24 passing, with 5 touchdowns, no interceptions, and a passer rating of 146.7, in a 45–10 win. This win improved the Bengals' record to 5–2. After a 16–7 win against the Cleveland Browns in week 12, the Bengals swept their division for the first time in franchise history. Going into a week 15 game at San Diego, Bengals' receiver Chris Henry died. Playing with a heavy heart, Carson Palmer threw for 314 yards, with 2 touchdowns, and 1 interception, but only to lose on a last second field goal by the Chargers. Palmer had a 91.7 passer rating with 2 touchdowns and only 1 interception in 17–10 week 16 win against the Kansas City Chiefs. This win assured the Bengals' first winning season and division title since 2005. In Palmer's first full playoff game, he struggled. Palmer threw the ball with a 50 percent completion percentage, with 1 touchdown, 1 interception, and a 53.8 passer rating, in a 24–14 loss to the New York Jets. Palmer finished the 2009 season with a 60.5 completion percentage, 3,094 yards passing, 21 touchdowns, 13 interceptions, and a passer rating of 83.6. He seemed to have taken a step back from where he was in 2005, 2006, and 2007. In the 2010 NFL Draft, the Bengals drafted three more receivers for Carson Palmer: Oklahoma tight end Jermaine Gresham in the first round, Texas wide receiver Jordan Shipley in the third round, and Kansas wide receiver Dezmon Briscoe in the sixth round. 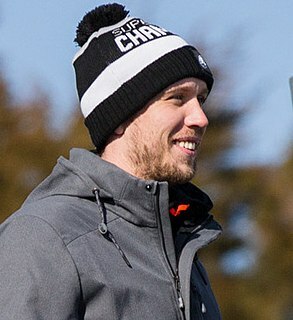 During OTA's (Organized Team Activities), Palmer asserted himself as the leader of the team by calling out Chad Ochocinco, saying that the number one receiver should be there with the team. Following the Bengals' 4–12 finish in the 2010 season, Palmer requested to be traded. Bengals president Mike Brown turned down Palmer's request the next day. News reports said that Palmer was prepared to retire if necessary. WCPO-TV reported that a friend of Palmer quoted him as saying, "I will never set foot in Paul Brown Stadium again. I have $80 million in the bank." Palmer also reportedly said: "I don't have to play football for money. I'll play it for the love of the game, but that would have to be elsewhere." Palmer's agent said, "Because of the lack of success that Carson and the Bengals have experienced together, Carson strongly feels that a separation between him and the Bengals would be in the best interest of both parties." In seven seasons under Palmer, the Bengals appeared in the playoffs twice (2005 and 2009), and did not win any playoff games. With punter Shane Lechler wearing Palmer's number 9 from Cincinnati, Palmer switched his jersey number to 3, his number at USC which was worn by Jon Kitna in Cincinnati at the time the Bengals drafted him. On October 23, Palmer came off the bench against the Kansas City Chiefs to relieve starting quarterback Kyle Boller who had thrown 3 interceptions and had the team down 21–0. Palmer completed 8 of his 21 for 116 yards and threw 3 interceptions in his Raider debut. He stated after the game, "I was told I was not going to play. I didn't know the offense, I also hadn't been training and working out, so it was a complete shock to me at halftime when (Raiders coach Hue Jackson) told me, 'Hey, you know we're going to get you in, in the third quarter.'" In his first start for the Raiders two weeks later Palmer threw for over 330 yards and had three touchdowns. He also threw three interceptions and lost a fumble. In his second start as a Raider during the Week 11 Thursday Night game against the division rival San Diego Chargers, Palmer showed further progress as he finished the game completing 14 of 20 passes for 299 yards and threw two touchdowns and a single interception for a quarterback rating of 125.0 in a 24–17 road win that would ultimately give the Raiders the lead in the division. After going 0 for 2, Palmer completed 10 straight passes, including two touchdowns of 33 & 26 yards to rookie wide receiver Denarius Moore. Palmer was on course for a perfect passer rating of 158.3 until he took a hit from Chargers' linebacker Travis LaBoy while attempting a pass early in the Fourth Quarter that resulted in wobbly pass picked-off by Paul Oliver. The Raiders ended the season 8–8, 4–5 under Palmer. They lost the AFC West tiebreaker to the Denver Broncos and finished one game out of the playoffs. In 2012, the Carson Palmer-led Raiders started the season 0–1 after a 22–14 home loss against the San Diego Chargers. Palmer had a good game statistically going 32 of 46 for 297 yards and a touchdown. In Week 2, Palmer completed 24 of 48 (50%) of his passes for 373 yards and a touchdown, but also an interception in a 35–13 loss to the Miami Dolphins. The Raiders returned home for a Week 3 matchup against their longtime historic rival of the Pittsburgh Steelers. Sitting at 0–2, Palmer drove the Raiders down the field in the final seconds to set up a field goal attempt for the Raiders to win. Palmer went near perfect in his pass attempts completing 24 of 34 for 3 touchdowns and an interception in the 34–31 win. In Week 4 however, Palmer struggled against the Denver Broncos going 19 of 34 for 202 yards in a 37–6 road loss. The Raiders went into their bye week with Palmer's stats standing at 99 of 162 on pass attempts for 1,081 yards with 5 touchdowns and 2 interceptions. The Raiders (who had finished 4–5 with Palmer as a starter) had also gone 5–8 with Palmer at the starting quarterback helm by this time. Returning from the bye week, Palmer and the Raiders traveled down south to face the Atlanta Falcons who were undefeated against AFC opponents. The Raiders got off to a good start with Palmer looking very sharp with 23 of 33 for 353 yards and a touchdown, but he also threw an interception as the Falcons completed the comeback drive to win 23–20. Palmer sat at 26 of 46 for 298 yards, a touchdown, an interception, and also a rushing touchdown against the Jacksonville Jaguars a week later. Palmer stayed sharp through the next game at Kansas City against the Chiefs going 14 of 28 for 209 yards, 2 touchdowns and an interception in a 26–16 win. A week later, the Raiders returned home for a game against the Tampa Bay Buccaneers. Despite the fact that Palmer had completed 39 of 61 for 414 yards and 4 touchdowns, the struggling quarterback also threw 3 costly interceptions in the 42–32 loss. A week later at Baltimore, Palmer still looked sharp in the 55–20 road loss to the Baltimore Ravens going 29 of 45 for 368 yards 2 touchdowns and an interception. In Week 11, the Raiders returned home for a game against a struggling defensive New Orleans Saints team. However, despite the fact that Palmer and the Raiders' offense struggled, the quarterback went 22 of 40 for 312 yards for 2 touchdowns and 2 interceptions in the huge 38–17 loss. In Week 12, Palmer returned to Cincinnati to face off against his former team the Cincinnati Bengals. Palmer struggled in this game going 19 of 34 for a season-low 146 yards for a touchdown and an interception in a 34–10 loss. In Week 13, the Raiders returned home for a game against the Cleveland Browns. Coming into this game at 1–2 against the AFC North, the Raiders were down by 3, but ended up losing 20–17 to the Browns despite the fact that Palmer was 34 of 54 for 351 yards, 2 touchdowns, and an interception. In Week 14, the Raiders stayed home for a Thursday Night Football game against the Denver Broncos. The Raiders lost 26–13 in spite of Palmer going 19 of 30 for 273 yards, 2 touchdowns and an interception. This game was his 9th straight game with at least 1 interception. In Week 15, the Raiders stayed home for the 3rd straight week for game 2 against the division rival Kansas City Chiefs, in which they won 15–0, with Palmer's streak of games with at least 1 interception coming to an end, but he still struggled as he went 18 of 29 for 182 yards. In Week 16, Palmer and the Raiders traveled to Charlotte, North Carolina, to take on the Carolina Panthers. Palmer early in the game suffered a further injury of his ribs, leaving him out for the rest of the game. As he went 3 of 3 for 31 yards in the game, quarterback Matt Leinart took over for the rest of the game. The Raiders, however, went on to lose by a score of 17–6. Out of all 14 games Palmer has started and completed, the Raiders went 4–11 under him, bringing his total to 8–15 as the teams' starting quarterback. In Week 1 against the San Diego Chargers, Palmer threw two touchdowns late in the game to win in an upset. In the same game, Palmer ran for a career-high 30 yards and got injured running for a first down. Instead of avoiding safety Eric Weddle, Palmer collided with him. He missed the next three games, in which backup Drew Stanton won against the New York Giants and San Francisco 49ers and lost to the Broncos. Upon his return the Cardinals went on to win five games in a row and remain the top seed in the NFC, with Palmer throwing 11 touchdowns to just 3 interceptions. On November 7, 2014, Palmer agreed to a three-year, $49.5 million contract extension with the Cardinals. On November 9, 2014, Palmer re-tore his ACL in a game against the St. Louis Rams. He was placed on the injured reserve list the next day, ending his season. Palmer underwent surgery in which doctors removed the donated Achilles tendon from his knee and replaced it with his own patellar tendon for reconstruction. The Cardinals went on to start Stanton for the remainder of the season until he too suffered a knee injury against the Rams in December. The Cardinals then started Ryan Lindley for the remainder of the season. The Cardinals finished 11–5 and went into the playoffs as a Wild Card, but lost to the Carolina Panthers in the first round, mustering only 78 yards of total offense while missing their starting and backup quarterback, starting and backup running back, starting left outside linebacker, and starting middle linebacker due to injury or suspension. Benjamin Todd Roethlisberger Sr., nicknamed Big Ben, is an American football quarterback for the Pittsburgh Steelers of the National Football League (NFL). He played college football at Miami University, and was drafted by the Steelers in the first round of the 2004 NFL Draft. Kyle Bryan Boller is a former American football quarterback. After playing college football for California, he was drafted by the Baltimore Ravens in the first round of the 2003 NFL Draft. He played for the Ravens from 2003 to 2008, the St. Louis Rams in 2009, and the Oakland Raiders from 2010 to 2011. Derek Matthew Anderson is a quarterback for the Buffalo Bills of the National Football League (NFL). He was drafted by the Baltimore Ravens in the sixth round of the 2005 NFL Draft. He played college football at Oregon State. A 2007 Pro Bowler, Anderson has also played for the Cleveland Browns, Arizona Cardinals and Carolina Panthers. Jordan William Palmer is a former American football quarterback. He was drafted by the Washington Redskins in the sixth round of the 2007 NFL Draft. He played college football at UTEP. Donald Wayne Hollas is a former American college and professional football player who was a quarterback in the National Football League (NFL) for six seasons during the 1990s. He played college football for Rice University, and thereafter was selected by the Cincinnati Bengals in the fourth round of the 1991 NFL Draft. Hollas also played for the Oakland Raiders. 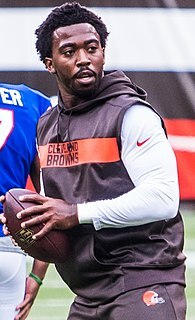 Tyrod Di'allo Taylor is an American football quarterback for the Los Angeles Chargers of the National Football League (NFL). He played college football for Virginia Tech, leading the Hokies to the 2011 Orange Bowl during his senior year. He was drafted by the Baltimore Ravens in the sixth round of the 2011 NFL Draft and served as the backup to starting quarterback Joe Flacco, including during the Ravens' Super Bowl XLVII victory over the San Francisco 49ers. Erik Rodriguez "EJ" Manuel Jr. is an American football quarterback for the Kansas City Chiefs of the National Football League (NFL). He played college football at Florida State and was drafted by the Buffalo Bills in the first round of the 2013 NFL Draft. Eugene Cyril Smith III is an American football quarterback who is currently a free agent. He played college football at West Virginia and was drafted by the New York Jets in the second round of the 2013 NFL Draft. He has also played for the New York Giants. Rayne Dakota "Dak" Prescott is an American football quarterback for the Dallas Cowboys of the National Football League (NFL). He played college football for the Mississippi State Bulldogs and was selected by the Cowboys in the fourth round of the 2016 NFL Draft. Paxton James Lynch is an American football quarterback for the Seattle Seahawks of the National Football League (NFL). He played college football at Memphis, and was drafted in the first round of the 2016 NFL Draft by the Denver Broncos. Lynch played just two seasons in Denver and made four starts before being released prior to the 2018 season. ↑ Sherman, Mitch. "The education of a quarterback". ESPN.com. Retrieved January 5, 2018. ↑ "JockBio: Carson Palmer Biography" . Retrieved January 8, 2016. ↑ "Carson Palmer: The High School Years". www.footballphds.com. Archived from the original on October 20, 2011. Retrieved May 30, 2011. 1 2 3 4 "Carson Palmer Bio – University of Southern California". Archived from the original on May 26, 2011. ↑ "1998 USC Trojans Stats". College Football at Sports-Reference.com. Retrieved January 5, 2018. ↑ "1999 USC Trojans Stats". College Football at Sports-Reference.com. Retrieved January 5, 2018. ↑ "USC vs Penn State Box Score, August 27, 2000". College Football at Sports-Reference.com. Retrieved January 5, 2018. ↑ "Colorado at Southern California Box Score, September 9, 2000". College Football at Sports-Reference.com. Retrieved January 5, 2018. ↑ "San Jose State at Southern California Box Score, September 23, 2000". College Football at Sports-Reference.com. Retrieved January 5, 2018. ↑ "USC at Arizona State Box Score, November 4, 2000". College Football at Sports-Reference.com. Retrieved January 5, 2018. ↑ "USC at UCLA Box Score, November 18, 2000". College Football at Sports-Reference.com. Retrieved January 5, 2018. ↑ "Notre Dame at Southern California Box Score, November 25, 2000". College Football at Sports-Reference.com. Retrieved January 5, 2018. ↑ "San Jose State at Southern California Box Score, September 1, 2001". College Football at Sports-Reference.com. Retrieved January 5, 2018. ↑ "USC at Oregon Box Score, September 22, 2001". College Football at Sports-Reference.com. Retrieved January 5, 2018. ↑ "Arizona State at Southern California Box Score, October 13, 2001". College Football at Sports-Reference.com. Retrieved January 5, 2018. ↑ "USC at Notre Dame Box Score, October 20, 2001". College Football at Sports-Reference.com. Retrieved January 5, 2018. ↑ "Oregon State at Southern California Box Score, November 3, 2001". College Football at Sports-Reference.com. Retrieved January 5, 2018. ↑ "Auburn at Southern California Box Score, September 2, 2002". College Football at Sports-Reference.com. Retrieved January 5, 2018. ↑ "USC at Kansas State Box Score, September 21, 2002". College Football at Sports-Reference.com. Retrieved January 5, 2018. ↑ "Washington at Southern California Box Score, October 19, 2002". College Football at Sports-Reference.com. Retrieved January 5, 2018. ↑ "USC at Oregon Box Score, October 26, 2002". College Football at Sports-Reference.com. Retrieved January 5, 2018. ↑ "USC at UCLA Box Score, November 23, 2002". College Football at Sports-Reference.com. Retrieved January 5, 2018. ↑ "Notre Dame at Southern California Box Score, November 30, 2002". College Football at Sports-Reference.com. Retrieved January 5, 2018. ↑ "Orange Bowl - USC vs Iowa Box Score, January 2, 2003". College Football at Sports-Reference.com. Retrieved January 5, 2018. ↑ "Carson Palmer Contract and Earnings". Spotrac. Spotrac. Retrieved January 2, 2018. ↑ "2003 Cincinnati Bengals Statistics & Players". Pro-Football-Reference.com. Retrieved January 5, 2018. ↑ "2004 Cincinnati Bengals Statistics & Players". Pro-Football-Reference.com. Retrieved January 5, 2018. ↑ "Cincinnati Bengals at New York Jets - September 12th, 2004". Pro-Football-Reference.com. Retrieved January 5, 2018. ↑ "Miami Dolphins at Cincinnati Bengals - September 19th, 2004". Pro-Football-Reference.com. Retrieved January 5, 2018. ↑ "Baltimore Ravens at Cincinnati Bengals - September 26th, 2004". Pro-Football-Reference.com. Retrieved January 5, 2018. ↑ "Cincinnati Bengals at Pittsburgh Steelers - October 3rd, 2004". Pro-Football-Reference.com. Retrieved January 5, 2018. ↑ "Cleveland Browns at Cincinnati Bengals - November 28th, 2004". Pro-Football-Reference.com. Retrieved January 5, 2018. ↑ "Cincinnati Bengals at Baltimore Ravens - December 5th, 2004". Pro-Football-Reference.com. Retrieved January 5, 2018. ↑ "Carson Palmer 2004 Game Log". Pro-Football-Reference.com. Retrieved January 5, 2018. ↑ "2005 NFL Standings & Team Stats". Pro-Football-Reference.com. Retrieved January 5, 2018. ↑ "Cincinnati Bengals Single-Season Passing Leaders". Pro-Football-Reference.com. Retrieved January 5, 2018. ↑ "2005 NFL Passing". Pro-Football-Reference.com. Retrieved January 5, 2018. ↑ "Cincinnati Bengals at Cleveland Browns - September 11th, 2005". Pro-Football-Reference.com. Retrieved January 5, 2018. ↑ "Minnesota Vikings at Cincinnati Bengals - September 18th, 2005". Pro-Football-Reference.com. Retrieved January 5, 2018. ↑ "Cincinnati Bengals at Chicago Bears - September 25th, 2005". Pro-Football-Reference.com. Retrieved January 5, 2018. ↑ "Houston Texans at Cincinnati Bengals - October 2nd, 2005". Pro-Football-Reference.com. Retrieved January 5, 2018. ↑ "Cincinnati Bengals at Jacksonville Jaguars - October 9th, 2005". Pro-Football-Reference.com. Retrieved January 5, 2018. ↑ "Cincinnati Bengals at Tennessee Titans - October 16th, 2005". Pro-Football-Reference.com. Retrieved January 5, 2018. ↑ "Pittsburgh Steelers at Cincinnati Bengals - October 23rd, 2005". Pro-Football-Reference.com. Retrieved January 5, 2018. ↑ "Green Bay Packers at Cincinnati Bengals - October 30th, 2005". Pro-Football-Reference.com. Retrieved January 5, 2018. ↑ "Cincinnati Bengals at Baltimore Ravens - November 6th, 2005". Pro-Football-Reference.com. Retrieved January 5, 2018. ↑ "Bengals QB Palmer signs extension through 2014". ESPN.com. December 29, 2005. Retrieved September 5, 2011. ↑ "Wild Card - Pittsburgh Steelers at Cincinnati Bengals - January 8th, 2006". Pro-Football-Reference.com. Retrieved January 5, 2018. ↑ ESPN.com: NFL votes to rein in TD celebrations. Retrieved on February 21, 2016. ↑ "ESPN – Palmer at minicamp, aiming for season opener return – NFL". Sports.espn.go.com. June 15, 2006. Retrieved September 20, 2010. ↑ Hobson, Geoff (September 16, 2010). "News – Palmer surgery: 'Very well' – Cincinnati Bengals". Bengals.com. Retrieved September 20, 2010. ↑ "SI.com – Photo Gallery – The Rehab of Carson Palmer". Sportsillustrated.cnn.com. Retrieved September 20, 2010. ↑ "San Diego Chargers at Cincinnati Bengals - November 12th, 2006". Pro-Football-Reference.com. Retrieved January 5, 2018. ↑ "Carson Palmer 2006 Game Log". Pro-Football-Reference.com. Retrieved January 5, 2018. ↑ "2006 Cincinnati Bengals Statistics & Players". Pro-Football-Reference.com. Retrieved January 5, 2018. ↑ Travis, Clay (September 9, 2010). "Fantasy Geeks: Carson Palmer's Ready To Rip It Up! – FanHouse – AOL Sports Blog". Sports.aol.com. Retrieved September 20, 2010. ↑ "Baltimore Ravens at Cincinnati Bengals - September 10th, 2007". Pro-Football-Reference.com. Retrieved January 5, 2018. ↑ "Cincinnati Bengals at Cleveland Browns - September 16th, 2007". Pro-Football-Reference.com. Retrieved January 5, 2018. ↑ "Cincinnati Bengals at Seattle Seahawks - September 23rd, 2007". Pro-Football-Reference.com. Retrieved January 5, 2018. ↑ "Carson Palmer 2007 Game Log". Pro-Football-Reference.com. Retrieved January 5, 2018. ↑ "Cincinnati Bengals at Baltimore Ravens - September 7th, 2008". Pro-Football-Reference.com. Retrieved January 5, 2018. ↑ "NFL – Cincinnati Bengals/Baltimore Ravens Box Score Sunday September 7, 2008 – Yahoo! Sports". Sports.yahoo.com. Retrieved September 20, 2010. 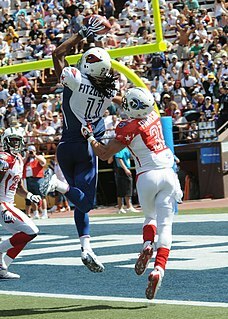 ↑ "Tennessee Titans at Cincinnati Bengals - September 14th, 2008". Pro-Football-Reference.com. Retrieved January 5, 2018. ↑ "Cincinnati Bengals at New York Giants - September 21st, 2008". Pro-Football-Reference.com. Retrieved January 5, 2018. ↑ "Cincinnati Bengals at Dallas Cowboys - October 5th, 2008". Pro-Football-Reference.com. Retrieved January 5, 2018. ↑ "Denver Broncos at Cincinnati Bengals - September 13th, 2009". Pro-Football-Reference.com. Retrieved January 5, 2018. ↑ "Cincinnati Bengals at Green Bay Packers - September 20th, 2009". Pro-Football-Reference.com. Retrieved January 5, 2018. ↑ "Chicago Bears at Cincinnati Bengals - October 25th, 2009". Pro-Football-Reference.com. Retrieved January 5, 2018. ↑ "Cincinnati Bengals at San Diego Chargers - December 20th, 2009". Pro-Football-Reference.com. Retrieved January 5, 2018. ↑ "Kansas City Chiefs at Cincinnati Bengals - December 27th, 2009". Pro-Football-Reference.com. Retrieved January 5, 2018. ↑ "Wild Card - New York Jets at Cincinnati Bengals - January 9th, 2010". Pro-Football-Reference.com. Retrieved January 5, 2018. ↑ "Carson Palmer 2009 Game Log". Pro-Football-Reference.com. Retrieved January 5, 2018. ↑ "2010 NFL Draft Listing". Pro-Football-Reference.com. Retrieved January 5, 2018. ↑ "Carson Palmer 2010 Game Log". Pro-Football-Reference.com. Retrieved January 5, 2018. 1 2 Reid Cherner, "Eye-opener: What should Bengals do about Carson Palmer? ", USA Today , March 2, 2011. ↑ "Cincinnati Bengals' Carson Palmer still not available, owner says". ESPN. 27 July 2011. Retrieved 28 July 2011. ↑ Reedy, Joe (July 29, 2011). "Palmer placed on Reserve/Did Not Report list; other moves". cincinnati.com. Archived from the original on July 31, 2011. Retrieved August 8, 2011. ↑ Florio, Mike (August 23, 2011). "Carson Palmer still hasn't officially retired". profootballtalk.com . Retrieved August 23, 2011. ↑ "Raiders acquire veteran QB Palmer from Bengals". NFL.com. October 18, 2011. Retrieved October 18, 2011. ↑ "Raiders get to keep 2013 first-round draft pick". Inside the Oakland Raiders. June 6, 2012. Retrieved August 17, 2012. 1 2 "Carson Palmer". Spotrac. Retrieved January 2, 2018. ↑ "Kansas City Chiefs at Oakland Raiders - October 23rd, 2011". Pro-Football-Reference.com. Retrieved January 5, 2018. ↑ "Raiders' Palmer faced Chiefs with knowledge of 15 plays". NFL.com. ↑ "Oakland Raiders at San Diego Chargers - November 10th, 2011". Pro-Football-Reference.com. Retrieved January 5, 2018. ↑ "2011 Oakland Raiders Statistics & Players". Pro-Football-Reference.com. Retrieved January 5, 2018. ↑ "San Diego Chargers at Oakland Raiders - September 10th, 2012". Pro-Football-Reference.com. Retrieved January 5, 2018. ↑ "Oakland Raiders at Miami Dolphins - September 16th, 2012". Pro-Football-Reference.com. Retrieved January 5, 2018. ↑ "Pittsburgh Steelers at Oakland Raiders - September 23rd, 2012". Pro-Football-Reference.com. Retrieved January 5, 2018. ↑ "Oakland Raiders at Denver Broncos - September 30th, 2012". Pro-Football-Reference.com. Retrieved January 5, 2018. ↑ "Oakland Raiders at Atlanta Falcons - October 14th, 2012". Pro-Football-Reference.com. Retrieved January 5, 2018. ↑ "Jacksonville Jaguars at Oakland Raiders - October 21st, 2012". Pro-Football-Reference.com. Retrieved January 5, 2018. ↑ "Oakland Raiders at Kansas City Chiefs - October 28th, 2012". Pro-Football-Reference.com. Retrieved January 5, 2018. ↑ "Tampa Bay Buccaneers at Oakland Raiders - November 4th, 2012". Pro-Football-Reference.com. Retrieved January 5, 2018. ↑ "Oakland Raiders at Baltimore Ravens - November 11th, 2012". Pro-Football-Reference.com. Retrieved January 5, 2018. ↑ "New Orleans Saints at Oakland Raiders - November 18th, 2012". Pro-Football-Reference.com. Retrieved January 5, 2018. ↑ "Oakland Raiders at Cincinnati Bengals - November 25th, 2012". Pro-Football-Reference.com. Retrieved January 5, 2018. ↑ "Cleveland Browns at Oakland Raiders - December 2nd, 2012". Pro-Football-Reference.com. Retrieved January 5, 2018. ↑ "Denver Broncos at Oakland Raiders - December 6th, 2012". Pro-Football-Reference.com. Retrieved January 5, 2018. ↑ "Kansas City Chiefs at Oakland Raiders - December 16th, 2012". Pro-Football-Reference.com. Retrieved January 5, 2018. ↑ "Oakland Raiders at Carolina Panthers - December 23rd, 2012". Pro-Football-Reference.com. Retrieved January 5, 2018. ↑ "Carson Palmer traded to Cards". ESPN. April 2, 2013. Retrieved April 2, 2013. ↑ "Carson Palmer 2013 Game Log". Pro-Football-Reference.com. Retrieved January 5, 2018. ↑ "2013 NFL Passing". Pro-Football-Reference.com. Retrieved January 5, 2018. ↑ "Carson Palmer: Game Logs at NFL.com". www.nfl.com. ↑ "Carson Palmer Adjusting to Arizona Cardinals' Challenging Offense". Sports Media 101. May 8, 2013. Archived from the original on August 8, 2013. Retrieved May 8, 2013. ↑ "Arizona Cardinals at Seattle Seahawks - December 22nd, 2013". Pro-Football-Reference.com. Retrieved January 5, 2018. ↑ "San Diego Chargers at Arizona Cardinals - September 8th, 2014". Pro-Football-Reference.com. Retrieved January 5, 2018. ↑ Alper, Josh (November 7, 2014). "Carson Palmer signs three-year extension, with Cardinals". NBCSports.com. Retrieved November 7, 2014. ↑ Smith, Michael (November 10, 2014). "Cardinals confirm Carson Palmer will go on IR with torn ACL". NBCSports.com. Retrieved November 10, 2014. ↑ "2015 Arizona Cardinals Statistics & Players". Pro-Football-Reference.com. Retrieved January 5, 2018. ↑ "Carson Palmer: Career Stats at NFL.com". www.nfl.com. ↑ "Green Bay Packers at Arizona Cardinals - December 27th, 2015". Pro-Football-Reference.com. Retrieved January 5, 2018. ↑ "Carson Palmer 2015 Game Log". Pro-Football-Reference.com. Retrieved January 5, 2018. ↑ "Divisional Round - Green Bay Packers at Arizona Cardinals - January 16th, 2016". Pro-Football-Reference.com. Retrieved January 5, 2018. ↑ "NFC Championship - Arizona Cardinals at Carolina Panthers - January 24th, 2016". Pro-Football-Reference.com. Retrieved January 5, 2018. ↑ "'Top 100 Players of 2016': No. 12 Carson Palmer". NFL.com. ↑ Wesseling, Chris (August 5, 2016). "Carson Palmer, Larry Fitzgerald sign 1-year extensions". NFL.com. Retrieved August 6, 2016. ↑ "Carson Palmer 2016 Game Log". Pro-Football-Reference.com. Retrieved January 5, 2018. ↑ "Arizona Cardinals at Indianapolis Colts - September 17th, 2017". Pro-Football-Reference.com . Retrieved October 14, 2017. ↑ Rosenthal, Gregg. "Carson Palmer out at least 8 weeks with broken arm". NFL. Retrieved October 22, 2017. ↑ Odegard, Kyle (October 26, 2017). "Carson Palmer Placed On Injured Reserve". AZCardinals.com. ↑ Weinfuss, Josh (December 2, 2017). "Carson Palmer feels 'pretty good' about returning this season". espn.com. Retrieved December 5, 2017. ↑ Bergman, Jeremy (January 2, 2018). "Cardinals QB Carson Palmer retires after 15 seasons". NFL.com. Retrieved January 2, 2018. ↑ "Carson Palmer Retirement Letter". AZCardinals.com. January 2, 2017. ↑ "Arizona Cardinals QB Carson Palmer retires after 15 NFL seasons". montrosepress.com. January 2, 2018. Retrieved January 2, 2018. ↑ Note: Dalton had an additional 300+ yard game in the 2013 post-season. 1 2 3 "Chicago/St. Louis/ Arizona Cardinals Team Encyclopedia". Pro-Football-Reference.com. ↑ "Carson Palmer". Forbes . 2015. Retrieved April 28, 2016. ↑ "Raiders acquire QB Palmer from Bengals". ↑ Hobson, Geoff (March 25, 2009). "No. 9 back in time". Bengals.com. Retrieved September 20, 2010. ↑ "From the Archives – Carson Palmer". Sports Spectrum. April 26, 2012. Retrieved December 23, 2013. Wikimedia Commons has media related to Carson Palmer .